Deputy Defense Minister says application of sovereignty over Judea and Samaria would not make Israel undemocratic. This week, the Civil Administration published data which was purported to show near-parity between the Jewish and Arab populations living between the Jordan River and the Mediterranean Sea. The report, which included Gaza, sparked discussions about a possible demographic threat to the Jewish State and whether it was necessary to separate from Judea and Samaria to preserve the Jewish character of the State of Israel. 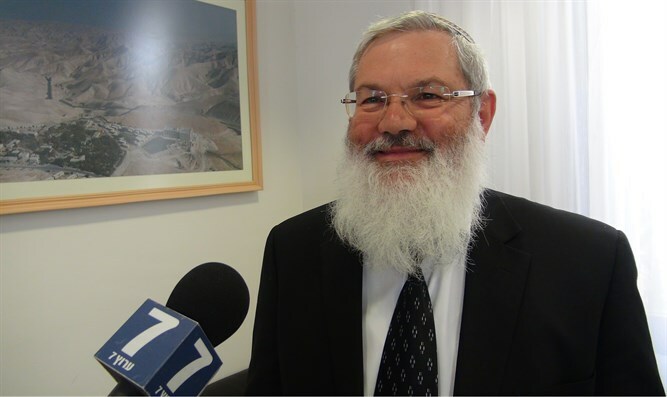 Deputy Defense Minister, MK Rabbi Eli Ben-Dahan, a supporter of the establishment of Israeli sovereignty over Judea and Samaria, addressed these concerns in an interview with Arutz Sheva. At the start of his remarks, Rabbi Ben-Dahan stated that the study of demographics is not an exact science. "There were demographers who prophesied a few years ago that the State of Israel itself would soon not have a majority of Jews, and it turned out that this was not true. The debate between the demographers is a fight over numbers, and each one constructs his forecast from the sources he has and from which he draws information, such as the Palestinian Central Bureau of Statistics and other sources." "The clear and absolute thing is that we are here in the Land of Israel and we are not afraid of any attempts to frighten us. They want to scare us, that maybe soon we will not be a majority and therefore we have to abandon Judea and Samaria. This is a grave mistake. He recalled previous demographic warnings that did not take into account the large Aliyah of over 1 million from the former Soviet Union. "We have to focus on the main issue. We are in Judea and Samaria because this is our land, and we are here so that we will never leave it. Sovereignty must be applied in Judea and Samaria as soon as possible. When that happens, it will become clear how incorrect those numbers are. According to Rabbi Ben-Dahan, the application of Israeli sovereignty would not have to entail the conferring of automatic citizenship on the Arab residents living there or the right to vote. In fact, the sovereignty plan is intended to begin in the Jewish communities of Judea and Samaria, all located in Area C, or with all residents in Area C of which only about 80,000 Palestinian Arabs. "Israel has united all parts of Jerusalem, but the residents of East Jerusalem are not entitled to vote for the Knesset. They vote only for the municipality," he said. Arab residents of eastern Jerusalem can choose to apply for Israeli citizenship, but are not forced to become Israeli citizens. "Even if we apply Israeli law in Judea and Samaria, full civil rights are not just given, and certainly not on the first day. We will have to wait several years as is customary in every country. "Is Israel less democratic because of the status granted to the residents of East Jerusalem?" he asked, addressing the undemocratic nature of the Palestinian Authority. "The truth is that we are not talking about citizens who go to the polls every four years. The last elections [held by the Palestinian Authority] were 13 years ago. They are far from a meaningful democracy as we know it There are many examples of citizenship that are given gradually, even in the US there is a large territory, Guam, where the people do not have full citizenship [and cannot vote in the presidential elections]. These examples exist." And what about the use of PA data by the Civil Administration? There are claims that the PA counts Arabs who have left the country as well as some who are not alive anymore. Rabbi Ben-Dahan said that the Israeli sources are not based on the data publoished by the PA Central Bureau of Statistics, but instead "explicitly state that the data in our possession are the best that we can collect. These are not data that we can rely on and are partial at best. They are gathered according to the measuring tools we have."